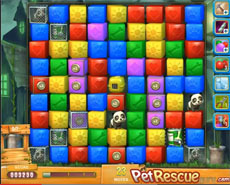 The problem in pet rescue level 347 is that the 32 moves you have to pass the level maybe are not enough. You have to bring down a pet in pet box from the middle of the screen (clearing some blocks there). Then you have to rescue the two pets at right, using the paint brush boosters there are in wires and after that the pets at the left with the same way. You have to do all of them in about 17 moves. So you have now about 15 moves to rescue the two pets in the middle, and the 7th pet it will come down in a pet box. You can be helped in this task by the paint brush boosters there are in the screen. Don’t spend your moves aimlessly because you will not pass the level. Still can’t pass pet rescue level 347? Watch the following walkthrough vid.